The Army is trying to answer a new question: Who is resilient enough to return to Afghanistan, in spite of the demons they are still fighting? FORWARD OPERATING BASE ARIAN, Afghanistan — The soldiers of the 10th Mountain Division were among the first Americans to arrive in Afghanistan in 2001. Now, they will be some of the last to leave. They have served as many as seven combat tours each, with the accompanying traumas – pulling a friend’s body from a charred vehicle, watching a rocket tear through a nearby barracks, learning from email that a marriage was falling apart. As the Army has knowingly redeployed soldiers with symptoms of PTSD — and learned of the remarkable coping skills of some — it is now regularly embedding psychologists with units in the field. They are treating men and women recovering from 12 years of relentless combat, even as the soldiers continue to fight. On FOB Arian, there is the young sergeant whose previous tour in Afghanistan — a relentless blur of firefights and rocket attacks — has left him unable to sleep. There is the officer who returned home from Iraq and screamed in nightmares for his men to take cover, until his wife woke him up, bewildered. There is the battalion commander, Lt. Col. Daniel Morgan, who watched as his marriage nearly disintegrated over the course of several deployments and who found himself sitting at a beach house in North Carolina a few years ago, stung by his inability to communicate. The men are not at home recovering. They are back in one of the most dangerous stretches of Afghanistan. The Taliban fires mortars at their base almost every day. “You’re never fully ready to redeploy,” the sergeant said. Mental-health professionals have traveled with troops in the past, but they were more typically used as a resource for soldiers when they returned to the United States. But in 2010, the Army’s Mental Health Advisory Team recommended a 1-to-700 ratio of behavioral health specialists to soldiers in the field. In Afghanistan, that percentage is now even higher. At FOB Arian, Capt. 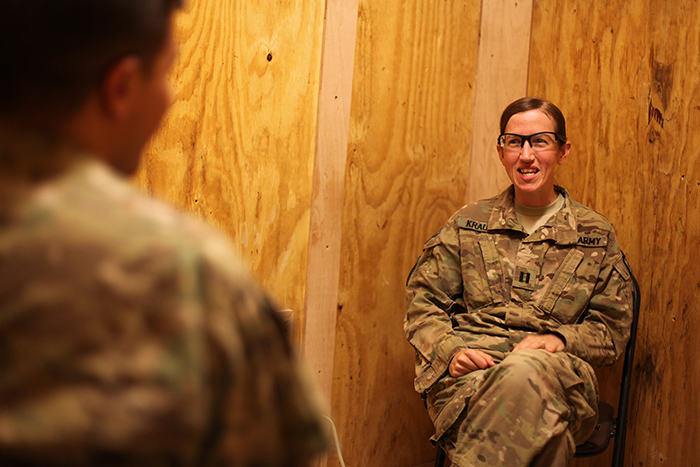 Stacey Krauss is one of dozens of behavioral health experts deployed across Afghanistan, where more than 60,000 U.S. troops are still based. Krauss meets with her patients in a tiny room with plywood walls. She is a marriage counselor and a financial adviser and the one who hears soldiers recount the horrors of war. She is often the only person on Arian who knows how the soldiers of 10th Mountain are really holding up. In 2009, Maj. Loreto Borce was a company commander in Iraq when one of his soldiers, Spec. Beyshee Velez, shot and killed an American contractor. Velez, a medic, had treated close friends with gruesome injuries, including several who later died. In February 2010, an Army mental-fitness board said Velez had experienced a “short psychotic episode” during the shooting. For Borce, who is now one of the top officers at FOB Arian, it was more than a cautionary tale. Velez was Borce’s responsibility. How had his soldier unraveled without him noticing? Back home, Borce developed his own triggers. For the first time, he felt anxious in large crowds. He went to the Thanksgiving Day parade in New York City and felt tightly wound, ready to burst. He tried talking to civilian therapists, but he did not seem to be making progress. “I felt like I was being blamed,” he said. His commanders and his subordinates said Borce is an impeccable leader, the kind of soldier his unit needs here in Ghazni province. He was chosen to redeploy. He followed orders. But he acknowledges that he was still reckoning with what he had already been through, even as he boarded the plane for Afghanistan in January. Like dozens of others, he has met with Krauss. He has also tried hard to monitor himself. Not far from Borce’s office, across the sparse base plopped in the middle of the Afghan desert and soon to be leveled, Staff Sgt. Jerry Price works in FOB Arian’s medic station. Afghans are now doing the bulk of the fighting here, and the majority of the casualties Price treats are from the country’s nascent army. But the wounded and the dead whom he thinks most about are from his first deployment, in 2003. Price was in Iraq just as the insurgency exploded, a young medic suddenly responsible for keeping his wounded friends alive. He saved some, but others he could not, a helplessness that weighed heavily on him. When he returned home, he said, there was no support network. He was told to check off the right boxes on the Army’s mental-health assessment. That mentality has changed, he said, and for plenty of reasons. Last year there were 349 suicides among active-duty U.S. troops, more than the 295 Americans who died last year in Afghanistan. Army officials call Price’s attitude an example of the resiliency they are looking for in redeployable troops. He may still be reckoning with the ghosts of past tours, they say, but he knows how to cope. To keep the soldiers mentally healthy, Army psychologists suggest exercise and hobbies for down time. They even provide a therapy dog with which soldiers can decompress. Krauss, 31, of Philadelphia, travels more than almost any other soldier in her brigade, often stepping off a Black Hawk and strolling around a base making small talk until a soldier asks offhand if she has a minute to meet privately. “Are you free later this afternoon?” a young soldier asked casually during a recent walkabout. Despite the Army’s new attention to mental health, there are still questions about the effectiveness of its “composite risk assessment,” which is used to gauge the mental state of its soldiers. Critics say that too much emphasis is put on what the Army considers “risk-taking behaviors,” such as owning a motorcycle or guns, or having hobbies such as bungee jumping or skydiving. “When I get calls on a Friday night — about guys getting into fights, getting DUIs or possible suicide risks — they’re never the ones that were assessed as being high-risk,” said Morgan, the battalion commander. Morgan decided that his unit would create its own assessment, which asks detailed questions about how soldiers are coping. It has been about 60 percent more accurate than the Army’s measurement, he said. When the soldiers of FOB Arian gather for cigars in the evening, the subject of previous tours almost always comes up. There is little effort to hide behind tough facades. Instead, the conversation shifts to what works and what does not, how to deal with the issues many here are feeling their way through. In all likelihood, this will be their last deployment in Afghanistan. The United States is planning to withdraw the majority of its troops by the end of 2014, possibly keeping about 8,000 troops, mostly advisers, on the ground. Most of the soldiers are not authorized to talk publicly about the likelihood of future deployments. But in a unit that has been deployed so often over the past decade, many are still unconvinced that they will be leaving Afghanistan for the last time.